The paper is concerned with ranking academic journal quality and research impact in Finance, based on the widely-used Thomson Reuters ISI (2013) Web of Science citations database (hereafter ISI). The paper analyses the 89 leading international journals in the ISI category of “Business – Finance” using quantifiable Research Assessment Measures (RAMs). The analysis highlights the similarities and differences in various RAMs, all of which are based on alternative transformations of journal citations and impact. Alternative RAMs may be calculated annually or updated daily to determine the citations frequency of published papers that are cited in journals listed in ISI. The RAMs include the classic 2-year impact factor including journal self citations (2YIF), 2-year impact factor excluding journal self citations (2YIF*), 5-year impact factor including journal self citations (5YIF), Immediacy including journal self citations, Eigenfactor (or Journal Influence), Article Influence, h-index, PI-BETA (Papers Ignored - By Even The Authors), Self-citation Threshold Approval Rating (STAR), 5YD2 (namely, 5YIF divided by 2YIF), Escalating Self Citations (ESC), and ICQ (Index of Citation Quality). The paper calculates the harmonic mean of the ranks of up to 16 RAMs. It is shown that emphasizing 2YIF to the exclusion of other informative RAMs can lead to a misleading evaluation of journal quality and impact relative to the harmonic mean of the ranks. The analysis of the 89 ISI journals in Finance makes it clear that there are three leading journals in Finance, namely Journal of Finance, Journal of Financial Economics and Review of Financial Studies, which form an exclusive club in terms of the RAMs that measure journal quality and impact based on alternative measures of journal citations. 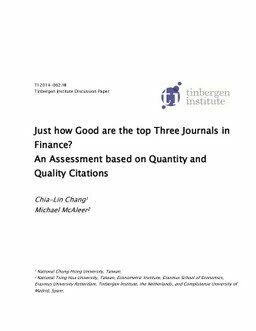 The next two journals in Finance in terms of overall quality and impact are Journal of Accounting and Economics and Journal of Monetary Economics.